Sp. pl. ed. 2, 2: 975 (1763). Cotton, upland cotton, American cotton, American upland cotton, green seed cotton (En). Coton, cotonnier, coton velu, cotonnier américain (Fr). Algodoeiro, algodoeiro americano (Po). Pamba (Sw). Gossypium hirsutum is primarily known from cultivation, but wild forms exist as well. It probably originated as a cross between Gossypium herbaceum L. and Gossypium raimondii Ulbrich or Gossypium gossypioides (Ulbrich) Standley in southern Mexico and was domesticated in Central America or northern South America. It has become the main cotton of commerce and is widely cultivated throughout the warmer parts of the world, including tropical Africa. It has often escaped and naturalized. In this article the word ‘cotton’ refers to information referring to all 4 cultivated Gossypium species (Gossypium arboreum L., Gossypium barbadense L., Gossypium herbaceum and Gossypium hirsutum); where information refers to Gossypium hirsutum only, this is stated explicitly. 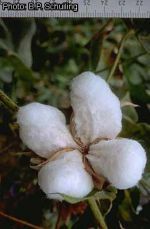 Cotton is the most important group of fibre plants in the world, and Gossypium hirsutum the most important of the cotton species. The main fibres of the cotton plant are the longer seed hairs (‘lint’), used for making yarn to be woven into textile fabrics, alone or in combination with other plant, animal or synthetic fibres. Cotton lint is also made into other products including sewing thread, cordage and fishing nets. Cotton textile cuttings and rags serve in the paper industry for the production of the best writing, book and drawing paper. Short fibres (‘fuzz’ or ‘linters’) are processed into a range of products, including papers, twine, automobile upholstery, explosives, plastics and photographic film. Linter pulp is made into various types of paper, depending on its grade. Linters have also been used for the production of cellulose acetate and viscose. Cotton stalks are processed into paper and paperboard, for instance in China, and into cement-bonded particle board. Oil obtained from cotton seed is industrially used in a range of products, including margarine, mayonnaise, salad and cooking oils, salad dressing and shortening. It is also made into soap, cosmetics, lubricants, sulphonated oils and protective coatings. Locally it serves for cooking and frying. Blends of cotton-oil biodiesel and diesel fuel can be used in conventional diesel engines without any major changes. The seed cake remaining after oil extraction is an important protein concentrate for livestock. Low-grade cake is used as manure. The whole seed can be fed to ruminants, which are less sensitive to the toxic gossypol in the seed than non-ruminants, or is applied as manure. Hulls are a low-grade roughage for livestock or serve as bedding or fuel. Leftover bolls, leaves and thin twigs are grazed by ruminants. Dry stalks serve as household fuel. Local uses of Gossypium hirsutum in tropical Africa include the use of the fibre for stuffing pillows and mattresses. In Nigeria the seeds are ground in cold water to produce paint. In traditional medicine in Benin a decoction of the leaves of Gossypium hirsutum and those of Flueggea virosa (Roxb. ex Willd.) Voigt is taken for the treatment of intestinal colic, constipation, low blood pressure and asthenia. The powdered seed or a seed decoction is taken against convulsions with fever. In East Africa the root is chewed or a root decoction drunk against stomach-ache. Gossypium hirsutum accounts for more than 90% of the world cotton production. Most of the remainder comes from Gossypium barbadense, which produces longer, finer and more expensive fibre than Gossypium hirsutum but yields less and shows limited adaptation to most cotton-growing areas. Two other cotton species, Gossypium arboreum and Gossypium herbaceum, are grown to some extent in Africa and Asia. According to FAO estimates the annual world cotton production in 2004–2008 was about 70 million t seed cotton (unginned cotton, containing seed, lint and fuzz), from 34 million ha. The main producers were China (20.3 million t seed cotton per year), the United States (10.8 million t), India (10.8 million t), Pakistan (6.3 million t), Brazil (3.7 million t), Uzbekistan (3.7 million t), Turkey (2.3 million t) and Greece (1.1 million t). The main producing countries in tropical Africa in this period were Burkina Faso (620,000 t per year), Nigeria (503,000 t), Mali (401,000 t), Benin (306,000 t), Zimbabwe (296,000 t), Tanzania (277,000 t), Côte d’Ivoire (236,000 t), Sudan (231,000 t), Cameroon (241,000 t), Mozambique (170,000 t), Chad (163,000 t) and Zambia (137,000 t). The world seed cotton production increased by 82% from 1974–1978, when the average world cotton production was about 38 million t. In the same period, the production in West, Central and southern Africa (regions as defined by PROTA) increased, while that in East Africa decreased. The production in West Africa increased by 393%, from 460,000 t in 1974–1978 to 2.3 million t in 2004–2008. In southern Africa the production increased by 94%, from 334,000 t in 1974–1978 to 648,000 t in 2004–2008. The increase in Central Africa was 51%, from 286,000 t in 1974–1978 to 432,000 t in 2004–2008. In East Africa the annual production declined by 21%, from 874,000 t to 686,000 t, mainly because of much lower production in Sudan (from 531,000 t to 231,000 t). The enormous increase in cotton production in West Africa was the result of an increase in the area under cotton (144%, from 928,000 ha to 2.3 million ha) as well as an increase in yields (105%, from 490 kg/ha to 1010 kg/ha). In 2004–2008 world cotton lint exports amounted to about 8.1 million t per year, with an export value of US$ 10,600 million. The major exporting countries were the United States (3.2 million t per year), Uzbekistan (831,000 t), India (756,000 t), Australia (435,000 t), Brazil (396,000) and Greece (248,000 t). The main exporters of cotton lint in tropical Africa were Mali (203,000 t per year), Burkina Faso (182,000 t), Benin (114,000 t), Côte d’Ivoire (93,000 t), Zimbabwe (91,000 t), Cameroon (85,000 t), Zambia (53,000 t), Tanzania (50,000 t) and Sudan (50,000 t). The main importers in 2004–2008 were China (2.7 million t per year), Turkey (735,000 t), Indonesia (534,000 t), Pakistan (483,000 t), Thailand (423,000 t), Bangladesh (422,000 t) and Mexico (373,000 t). The imports into countries of tropical Africa were generally very small, with Zimbabwe (31,000 t per year) and Mauritius (25,000 t) being the main importers. The world cottonseed oil production in 2004–2008 averaged 4.8 million t per year. The major producers were China (1.6 million t per year), India (642,000 t), Pakistan (446,000 t), the United States (407,000 t), Uzbekistan (306,000 t), Brazil (259,000 t) and Turkey (235,000 t). In tropical Africa Burkina Faso produced 51,000 t cottonseed oil per year in 2004–2008, Mali 43,000 t, Benin 23,000 t, Sudan 22,000 t, Nigeria 20,000 t, Tanzania 19,000 t, Zimbabwe 17,000 t, Cameroon 17,000 t, Mozambique 12,000 t and Chad 11,000 t. Cottonseed oil exports in 2004–2008 were only about 150,000 t per year, with an export value of US$ 106 million. Cotton fibres are unicellular extensions of epidermis cells of the seed. Two types of fibres are distinguished: long fibres (‘lint’) and short fibres (‘fuzz’ or ‘linters’). Cotton lint fibres are 10–40(–64) mm long, with a diameter of (12–)18–28(–42) μm and a length:width ratio of 1000–4000. The lint of Gossypium hirsutum is about 20–30 mm long. In international trade, the fibre length or ‘staple length’ of cotton is expressed in fractions of inches. Fuzz fibres are similar in appearance to lint fibres, but shorter (2–7 mm long), more cylindrical and with thicker walls. Apart from fibre length and its uniformity, the most important properties of cotton are fineness (diameter), maturity, strength and elasticity. The combined fineness and maturity (the degree to which the secondary cell wall has developed) of cotton fibre is usually determined by resistance to air flow, and expressed in a value called ‘micronaire’, reflecting the linear density of fibres. Typical values of the tensile strength, elongation at break, and Young’s modulus of cotton fibre are 285–595 N/mm², 7.0–8.0% and 5500–12,600 N/mm², respectively. Among the world’s major textile fibres, cotton has a unique combination of properties, being strong, comfortable, washable, durable and printable. It also blends well with other fibres to give it additional strength, lustre and crease resistance. On a dry weight basis, cotton fibre contains 88–96% α-cellulose, 3–6% hemicelluloses and 1–2% lignin. Stem fibre cells of Gossypium hirsutum investigated in Greece were about 0.8 mm long, with a diameter of 18–20 μm, a cell wall thickness of 3–4 μm and a lumen width of 12–13 μm. The stems contained 40–44% α-cellulose and 13–18% lignin. Cotton seeds remaining after ginning consist of linters (5–10%), oil (15–33%), oilcake (33–45%) and hulls (24–34%). Cottonseed oil is a semi-drying oil obtained by mechanical and/or solvent oil extraction from the seed. The principal fatty acids in cottonseed oil are linoleic acid (42–59%), palmitic acid (20–34%) and oleic acid (13–25%). The seed oil also contains 0.5–1(–2)% cyclopropenoid fatty acids, which are known to cause physiological disorders in animals. The oil as well as other plant parts of Gossypium species contain gossypol, a triterpenoid aldehyde, which is toxic to humans and animals, monogastric animals in particular. Gossypol has insecticidal, antimicrobial, antifertility and antitumour properties. Gossypol and related compounds have been implicated in conferring insect tolerance or resistance and antimicrobial properties to cotton plants. Glandless, gossypol-free cultivars exist, but they are more vulnerable to pests. The gossypol content of Gossypium hirsutum seeds (0.51–0.77% of dry matter) is generally lower than that of Gossypium barbadense (0.60–1.15%), with a lower proportion of the gossypol present in the more biologically active free form. Gossypol can be removed from the oil by solvent extraction, following mechanical and/or solvent oil extraction from the seed. The cake and meal contain over 40% crude protein, but are not without danger for monogastric animals, because of the gossypol they contain. The gossypol in the cake can be removed or made harmless by chemical (ferrous salts) or physical (heating) means, but this is more difficult to achieve economically than removing gossypol from the oil. It has been suggested that adult cattle should have less than 0.1–0.2% gossypol in the total ration, which would amount to 1.8–2.7 kg of Gossypium hirsutum seed per day. The oil of Gossypium hirsutum has shown antibacterial activity against Gram-positive and Gram-negative bacteria, and the antibacterial activity was not affected by fermentation of the oil. Annual herb or perennial shrub up to 3 m tall, usually much branched, with nearly all parts irregularly dotted with black oil glands. Leaves spirally arranged; stipules ovate to lanceolate, often falcate, 5–15(–20) mm × 2–5 mm; petiole 2–10 cm long; blade orbicular in outline, 3–15 cm in diameter, palmately 3-lobed, rarely palmatifid, lower ones sometimes 5-lobed, upper ones occasionally ovate and entire, base cordate, lobes broadly ovate to triangular, apex acute to acuminate, sinuses acute to rounded, margin entire, densely pubescent to glabrous, palmately 5–7-veined, with nectaries on the central basal veins beneath. Flowers solitary, usually on sympodial branches; pedicel 1–4 cm long, not articulated, with 3 nectaries below the insertion of the epicalyx segments; epicalyx segments (bracteoles) 3, free, closely enveloping the flower and fruit, ovate to triangular, 2–6.5 cm × 1.5–4 cm, cordate at base, margin with 3–19 acuminate teeth, persistent; calyx campanulate to cupular, 5–7 mm long and 6 mm in diameter, truncate or with 5 rounded (rarely acuminate) segments, outside with 3 inconspicuous nectaries, ruptured after flowering; corolla usually pale yellow to white, rarely with a purplish centre, petals 5, imbricate, obovate, 2–5.5 cm long; stamens numerous, forming a column 1–2 cm long, filaments 3–4 mm long, anthers 1-celled; pistil with 3–5-celled ovary and one short style with clavate, 3–5-sulcate stigma. Fruit (‘boll’) an ovoid or globose capsule 2–5 cm × 1–1.5 cm, rostrate at the apex, coarsely pitted, glabrous, opening loculicidally, 3–5-celled with several seeds per cell. Seeds ovoid, 3.5–10 mm long, acute at the hilum, black or brown with a dense covering of white or rusty, long, woolly hairs (lint or floss) and with a fine, short tomentum (fuzz) everywhere or only at the hilum. Seedling with epigeal germination. Gossypium comprises about 50 species distributed in warm temperate to tropical zones. The origin of the genus is unknown, but 3 primary centres of diversity exist: in Australia, in north-eastern Africa to Arabia, and in western-central to southern Mexico. The 4 cultivated cottons of the world (the Old World diploids Gossypium arboreum and Gossypium herbaceum and the New World tetraploids Gossypium barbadense and Gossypium hirsutum) have been domesticated independently in different parts of the world. 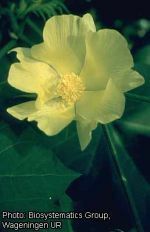 The taxonomy of Gossypium is complicated, partly due to the domestication of 4 distinct species and extensive interspecific hybridization. The literature is confusing and authors disagree on the identity of many species, subspecies, sections, varieties, forms, races and cultivars that have been distinguished. Currently the taxonomic system of P.A. Fryxell, with about 50 species grouped into 4 subgenera and 8 sections, is the most generally accepted one. It is mainly based on morphological and geographical data, but is confirmed by cytogenetic and molecular evidence. Cytological research has led to the recognition of 8 basic diploid ‘genomic groups’, designated A through G, plus K. In general, species within a genomic group can form fertile interspecific hybrids. Gossypium barbadense and Gossypium hirsutum belong to subgenus Karpas: tetraploid New World species with AD-genome, whereas Gossypium arboreum and Gossypium herbaceum are included in subgenus Gossypium: diploid Old World species with A-genome. – latifolium: annual subshrub with medium-sized to very large bolls, early maturing but with a wide range of day-length sensitivity; cultivated pantropically and commercially the most important cotton group of the world, collectively also called ‘upland cotton’. – marie-galante: perennial, strongly arborescent cotton; cultivars are strongly daylength sensitive; of great agricultural importance and widely distributed in all cotton-growing areas, including Côte d’Ivoire and Ghana, occurring as a large shrub or small tree in compounds and waste places. – morrilli: stout, upright, profusely branched shrub with a rounded appearance, with small, round bolls; grown in central Mexico. – palmeri: pyramidally shaped, glabrous shrub with distinctive laciniate leaves, flowering prolifically and bearing numerous small bolls; cultivated in western Mexico. – punctatum: perennial, slender-stemmed shrub, characterized by leaves with 3 lobes and shallow sinuses, bearing a large number of small bolls having seed with short fibres; mainly occurring in Central America, probably carried from Central America to Senegal in the 17th century, and spread eastwards from there, replacing the Old World cotton (mainly Gossypium herbaceum) grown there; nowadays the most widely grown cotton in West Africa. – richmondi: large, profusely branched, sprawling shrub with bolls of moderate size; grown on the Pacific side of the Isthmus of Tehuantepec (southern Mexico and Guatemala). – yucatanense: small, much-branched, procumbent or prostrate subshrub, only known wild in undisturbed beach vegetation on the northern coast of the Yucatan Peninsula; bolls small, widely flaring, seeds small, with sparse, coarse, brown lint; agronomically the most primitive group, the only one known to grow wild, intergrading morphologically with race ‘punctatum’. Cotton lint fibres are smooth-looking, ribbon-like and twisted, with the fibre walls showing longitudinal and spiral striations. The fibre walls contain many layers of cellulose chains, which run spirally and give dry fibres their characteristic twisting appearance. The hairs are covered with a waxy cuticle, giving unprocessed fibre a greasy feel and making it water-repellent. On drying at maturity the fibres lose their tubular shape and become ribbon-like (kidney-shaped in cross-section), twisting in different directions forming the well-known convolutions. Desiccation at maturity is an irreversible physical process, generating technological properties that make the cotton fibre very suitable for textile production. 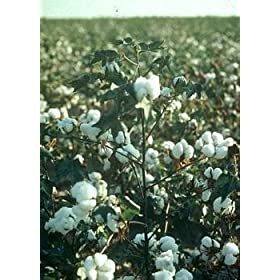 Cotton is normally a perennial plant with an indeterminate growth habit, but is usually grown as an annual, with the formation of nodes on the main stem stopped by fruit load, temperature, soil moisture, photoperiod, or a combination of these factors. The crop cycle is 120–220 days. Seedlings emerge 5–15(–30) days after sowing and the first true leaf unfolds 7–9 days later, but these processes vary with temperature. Upon germination, seedlings initiate a long taproot, which can reach a depth of more than 25 cm by the time the cotyledons unfold and may reach a depth of 3 m by mid-season. The plant remains unbranched for about 1 month. The shoot system is dimorphic, with the main axis and lower branches (emerging from axillary buds) being monopodial and vegetative, whereas the fruiting branches (emerging from extra-axillary buds) are sympodial. Fruiting branches develop as primary branches higher on the main stem and as secondary branches on vegetative branches. Generally only one fruiting branch develops at each node, with 3–5 fruits per branch. In Gossypium hirsutum the first fruiting branch appears at node 4–5 of the main stem, between 1 and 2 months after sowing, and 35–70 days after sowing the first visible flower buds appear as small, green, pyramidal structures, known as ‘squares’. They need 20–35 days to develop into open flowers. The flowers mostly open near dawn and pollination normally occurs within a few hours. Self-pollination is the predominant mating system, but visiting insects can cause considerable outcrossing (up to 40%). The flowers turn pink in the afternoon and red by the following day. They start withering late on the second day and die on the third day. Flowering peaks at 3(–6) weeks after the onset and may continue for about 6 weeks. The fruits grow very quickly after pollination, reaching their final size in 15–25 days. After a further (20–)25–45(–60) days, depending on genotype and environmental conditions, they are ripe. Usually the dry fruits open at their sutures and the white, fluffy fibre-mass emerges. The seeds remain attached to the placenta and are only separated by picking or by very strong rain or wind. During the first 2–4 weeks after flowering (the elongation phase) the fibres grow rapidly, reaching their full length, and during the next 4–6 weeks (the secondary thickening phase) the cell walls of the fibres thicken through deposition of cellulose in consecutive layers. The cell wall thickness of a fibre, or the degree to which the fibre has been filled with cellulose, mainly depends on plant vigour during ripening. Upon boll opening the fibre dries and the lumen collapses, resulting in the characteristic twisted, ribbon-like appearance of the fibre that makes it spinnable. Shedding of squares and young bolls is common in cotton. It is aggravated by adverse conditions such as prolonged overcast weather, extreme temperatures, water stress, waterlogging, nutrient deficiencies, diseases and insect damage. Commonly 60% of the squares and young bolls are shed, but flowers are rarely shed. The ability to overcome adverse events by compensatory growth is characteristic for cotton. However, recovery is only partial and insignificant when severe insect damage occurs late in the season. Gossypium hirsutum requires a temperature of (15–)22–36(–42)°C during the growing season. The optimum temperature for germination is 29–30°C and the minimum temperature for germination of most cultivars is about 14–15°C, though some germinate at temperatures as low as 12°C. For optimum growth and development an average growing season temperature of 25–30°C is needed. Cool weather slows growth and development, leading to retarded and sometimes insufficient ripening. Cotton is extremely frost-sensitive. Ample sunshine promotes flowering and fruit set and the highest yields are obtained in dry areas under irrigation, for example in Arizona, United States. Cotton does not tolerate shade. The rainfall during the growing season should be (450–)750–1200(–1500) mm, with dry weather during ripening, because rainfall after fruit opening leads to a decreased fibre quality. Because of its deep rooting system, cotton is drought tolerant, but prolonged drought during flowering and fruiting causes yield reduction. Strong winds can damage the seedlings and the open bolls. Primitive cottons are usually photoperiod-sensitive, becoming reproductive at short to medium photoperiods, but modern cultivars are generally photoperiod-insensitive and can be grown at a wide range of latitudes. In tropical Africa Gossypium hirsutum is grown from sea-level up to 2000 m altitude. Gossypium hirsutum can be grown on medium to deep, light to heavy, well-drained soils with a moderate fertility and a pH of (5–)6–7.5(–9.5). Very fertile soils stimulate vegetative growth and may cause an excessively long vegetative period. Cotton is relatively salt tolerant, with a salt content of 0.5–0.6% normally not causing damage, but cultivars differ considerably in this respect. Cotton is propagated by seed. Seed saved from the previous harvest is rarely used, as the entire harvest is usually sold for ginning. Organized seed multiplication and distribution is important to guarantee seed quality and purity. It is usually recommended that seed be delinted by mechanical or chemical means, with the former being preferred for economic and environmental reasons. For mechanical sowing, removal of the fuzz is essential. Seeds lose their viability rapidly if their moisture content exceeds 10%, but seeds with a moisture content of 7% can be stored in sealed jars for up to 15 years. The 1000-seed weight of non-delinted seed is 50–150 g.
Cotton is sown directly in the field, and in tropical Africa this is generally done by hand. The sowing date is chosen in such a way that the harvest will coincide with the beginning of the dry season. The planting density varies widely with cultivar, climate and soil characteristics, and cultivation as well as harvest methods. Spacings are 50–120 cm between rows and 15–60 cm within the row. It is advised not to sow less than 5 seeds per hill. About 20–25 kg/ha delinted seed is necessary for sowing, for instance at 80 cm × 30 cm spacing (41,700 hills/ha) with 5 seeds per hill. The seed should not be sown deeper than 4–5 cm in sandy soils and 2–3 cm in clay soils. Fuzzy seeds require more water for germination compared to delinted seeds because imbibition of water is faster in delinted seeds. Good soil preparation before sowing is very important, because the seedlings do not penetrate hard or crusted soils easily and do not compete well with weeds until they are 3 weeks old. Dry season weeds can be killed by harrowing or hoeing. This greatly reduces weed competition after planting. Early soil cultivation, allowing early planting, extends the growing season. Although hand hoeing is predominant in some parts of Africa, animal- and tractor-drawn ploughs are being used more and more. Most cotton in Africa is grown on the flat, but ridges are necessary on poorly drained soils. It is possible to propagate cotton vegetatively by cuttings, budding or grafting. The development of rapid, reproducible and genotype-independent systems of in-vitro propagation of Gossypium species has been difficult, though methods have now been developed to produce large numbers of somatic embryos from callus from hypocotyl or cotyledon explants of Gossypium arboreum, Gossypium barbadense, Gossypium herbaceum and Gossypium hirsutum. Cotton is usually grown in rotation with other crops to control pests and soil-borne diseases. In northern Côte d’Ivoire, for instance, it is grown in a 4-year rotation, with cotton in the 1st year, maize in the 2nd, groundnut in the 3rd and sweet potato and/or cassava in the 4th. After these four years, the field is returned to fallow. Cotton may be intercropped with other annual crops, such as maize, sorghum and grain legumes. Within 2 weeks after sowing, gaps in the stand of cotton are resown, the crop is thinned and a first weeding round takes place. A second weeding and the final thinning and ridging are carried out 4–5 weeks after sowing, and the final weeding another 2–3 weeks later. In tropical Africa weeding is usually done by hand, but in West Africa draught animals are often used for between-row weeding and ridging. Herbicides are sometimes applied. Cotton has a very good nutrient uptake ability, and nutrient requirements are therefore moderate. The uptake of a crop producing 1680 kg/ha seed cotton has been estimated at 105 kg N, 18 kg P and 66 kg K per ha. With the seed cotton 40 kg N, 7 kg P and 14 kg K per ha are removed; with the crop residues (especially the leaves) 65 kg N, 11 kg P and 52 kg K per ha are removed. Half the N and all P and K are usually applied around sowing. The 2nd application of N is given about a month after sowing, at final thinning. Too much N stimulates vegetative growth and extends the vegetative period, whereas N-shortage leads to chlorosis, reduced growth and boll-shedding. Sufficient K is important for fibre quality and disease resistance and shortage leads to mottled yellowish leaves with brown concentric spots, with the leaf margins drying and curling inwards, and the leaves eventually drying out and being shed. P-deficiency results in dark green leaves and delayed flowering and fruiting. Gossypium hirsutum is mostly grown under rainfed conditions. Under rainfed conditions supplemental irrigation may help early planting and alleviate dry spells in mid season. To stop vegetative development, irrigation should cease shortly after boll opening has started. Cotton can be grown as a perennial and be cut back and ratooned, but this is not advisable, because perennial cotton can act as a host reservoir for cotton pests and diseases. Diseases are less important in cotton than pests. The most widespread diseases are bacterial blight, leaf spot, blackarm or boll rot caused by Xanthomonas axonopodis pv. malvacearum (synonym: Xanthomonas campestris pv. malvacearum), anthracnose caused by Glomerella gossypii (anamorph: Colletotrichum gossypii), Fusarium wilt caused by Fusarium oxysporum, and Verticillium wilt caused by Verticillium dahliae. 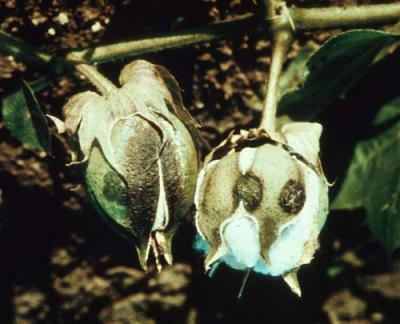 Bacterial blight is controlled by growing cotton only once every 3 or more years on the same field, removing the harvest remains and seed treatment. Gossypium hirsutum cultivars with adequate host resistance are available. Anthracnose can be controlled by the same measures, but resistant cultivars are not available. Gossypium hirsutum cultivars with resistance to Fusarium wilt are available. Cropping methods to control wilt diseases include crop rotation, sufficient K-fertilization and the control of nematodes. The most important virus diseases of cotton in tropical Africa are leaf curl, African cotton mosaic and cotton blue disease. Virus diseases are controlled by eliminating reservoir hosts and vectors, and by using tolerant or resistant cultivars. Cotton suffers from a wide spectrum of pests. Bollworms are among the most serious pests. They feed inside the bolls, damaging lint and seed and so causing considerable reduction in yield and quality. The main bollworms are American bollworm (Helicoverpa armigera), pink bollworm (Pectinophora gossypiella) and spiny bollworm (Earias spp.). Spiny bollworm, to which Gossypium hirsutum seems more susceptible than Gossypium arboreum and Gossypium barbadense, has a serious early effect of tipboring in the main stem leading to excessive formation of vegetative branches and delaying the setting of bolls, which makes them vulnerable to mid-season American bollworm and stainers. Control of bollworms has long relied heavily on insecticides. More recent is the use of genetically modified cultivars which are resistant. Leaf, stem and bud-sucking bugs can cause considerable damage. Jassids (Amrasca, Empoasca, Erythroneura, Jacobiella and Jacobisca spp.) are the first pests to appear, but a dense coating of long hairs on leaves and stems provides good protection. Whitefly (Bemisia tabaci) and cotton aphid (Aphis gossypii) are pests later in the season; the former is the vector of leaf curl and African cotton mosaic, the latter of cotton blue disease. Early sowing, weeding and harvesting and the use of short-season cultivars can reduce their damage. Cotton stainers (Dysdercus spp.) occur in all cotton-growing countries. They pierce the green bolls and inject the fungus Nematospora gossypii, which causes yellow staining of the lint, resulting in lower quality. About 4 alternating sprays of organophosphates and pyrethroids can overcome this pest. Fairly effective preventive control can be obtained by strict phyto-sanitation, early cropping of maize or sorghum followed by early ploughing and close planting of cotton using an early-maturing cultivar. The boll weevil (Anthonomus grandis) is economically the most serious cotton pest in the United States. Close relatives of cotton, such as Abutilon and Hibiscus species growing nearby are alternative hosts of cotton pests, especially stainers. Insect pests in cotton have been effectively controlled since 1945 with the use of insecticides. In tropical Africa control programmes are usually based on 4–6 sprayings per year, with the first one at 45–60 days after sowing, and subsequent sprayings every 2 weeks. The first 2–4 sprayings are usually with a pyrethroid and an organophosphorus compound, the other ones only with a pyrethroid. The repeated development of resistance of insect pests (especially the American bollworm) to new insecticides has in some countries led to excessive spraying, killing all natural enemies. This may also induce outbreaks of previously minor pests, requiring additional spraying. To reduce the use of pesticides, the application of Integrated Pest Management (IPM) or Integrated Weed and Pest Management (IWPM) is advocated. Very early field preparation including repeated weeding, fertilizer application, early planting of jassid-resistant cultivars, gapping, thinning and judicious use of pesticides on the basis of insect monitoring and damage thresholds, form the basis of interacting IWPM farming practices. Preventive weed control by ploughing or hoeing promptly after clearing the preceding crop stores moisture from unexpected storms in the subsoil which makes it possible to plant early. This encourages early fruiting well ahead of the main pest, American bollworm, and provides ample time for compensatory fruiting in case of early fruit damage. As insecticides against jassids are no longer needed they do not kill the natural enemies which control American bollworm in its vulnerable young stage. By the time the later pink bollworms, stainers and whitefly occur, the main crop will be safe. The most widely distributed economically important nematode in cotton is the root-knot nematode (Meloidogyne spp. ), whereas the reniform nematode (Rotylenchus spp.) is more restricted to tropical and subtropical environments. They can be controlled by rotation and chemicals, whereas cotton genotypes have been developed with some tolerance to the reniform nematode. 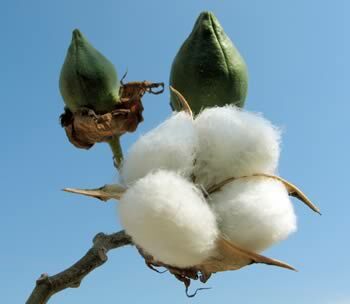 In tropical Africa cotton harvesting is generally done by hand, usually in 3 rounds, because leaving open bolls in the field may result in deterioration of lint quality. The first picking starts about 10 days after the fruits have opened, the other rounds follow at intervals of a little over 1 week. The cotton should be sorted right away during harvesting into white cotton, stained cotton and waste. At harvesting, the cotton must be as dry as possible. In forest regions and in the event of late rains, additional drying on racks may be necessary. Hand-picking gives cleaner cotton and a higher recovery than mechanical harvesting. Mechanical harvesting is practised in the United States and Australia, where hand-picking is too expensive; here low-growing, weakly-branching cultivars are sown at narrow spacings, and plants are sprayed with defoliants before harvesting. Mechanically harvested fibre needs heating and shaking to remove impurities, and this operation makes the fibre more brittle. After picking, the seed cotton is cleaned and transported in bags or sheets to the ginnery for checking, weighing, sorting and payment. The seed from the first ? of the crop picked is usually the most viable and may be kept separately in clearly marked bags. The lint from the first ? of the crop is the most mature and strong. After the cotton has been harvested, the cotton stems should be uprooted and burnt to prevent the build-up of pest and diseases. A seed cotton yield of up to 4 t/ha is possible under optimal conditions, but in practice it is seldom over 2.5 t/ha and the average world yield is about 2 t/ha. In most tropical African countries the yield is around 1 t/ha. Seed cotton of primitive cultivars yields 20–25% fibre after ginning, whereas good cultivars of upland cotton have a ‘ginning-outturn’ of at least 35% and sometimes over 40%. On average, 1 t seed cotton of Gossypium hirsutum yields 350 kg fibre, 120 kg oil, 300 kg cake, 160 kg hulls and 60 kg fuzz. In most tropical African countries, the harvested cotton is marketed through national agencies, but in some countries (for instance Nigeria and Kenya) it is done in collaboration with the private sector. In the case of national structures, yield forecasts are made by extension workers, to enable the mobilization of sufficient transport and processing facilities. In most countries the harvested cotton is separated into clean seed cotton and stained or trashy seed cotton. Cotton lint is removed from the seeds by ginning, which can be done with a hand gin (capacity of 2–3 kg lint/hour) or mechanically. Mechanical ginning can be done with a saw gin (capacity of 300 kg lint/hour) for the shorter stapled cottons, or with the more gentle roller gin (capacity of 30 kg lint/hour) for the longer stapled fine types. In some African countries, such as Kenya and Uganda, roller ginning is common, even for shorter stapled cotton. In West and Central Africa manual ginning may be done by placing the seed cotton on a block of wood or a flat stone, and squeezing out the seeds by rolling an iron or wooden rod over it. The optimum moisture content of the fibre for ginning is 5–7%. When the moisture content is lower, excessive fibre damage occurs; when it is higher, the amount of broken seeds is higher. The ginning outturn (the fibre weight as a percentage of the weight of the seed cotton) ranges from 44% in Côte d’Ivoire to 28–35% in DR Congo. After ginning, the fibres are pressed into bales of 216 kg and the seeds are transported to the oil mill. Cotton fibre quality is defined in terms of its length and uniformity, strength, elasticity and maturity, whereas whiteness and trash content also play a role. These properties can all be measured rapidly by the ‘High Volume Instrument’ (HVI). At the oil mill, fuzz is removed by additional saw ginning before seeds are crushed. The oil is usually extracted mechanically in a screw press, or chemically with a solvent. For local use in Nigeria the oil is obtained by grinding the seeds in hot water. For papermaking, linters are pulped by caustic solutions and bleached. Cotton textile cuttings and rags are pulped using the soda process. Dyed textiles and the presence of synthetic fibres and elastic materials in rags can cause problems in paper making. In Uzbekistan the Cotton Breeding Institute, the Institute of Genetics and Plant Experimental Biology and the National University of Uzbekistan together hold about 13,200 Gossypium hirsutum accessions. The cotton collection of the Chinese Academy of Agricultural Sciences (CAAS) kept in Beijing, Anyang and Hainan Island, contains about 7700 Gossypium hirsutum accessions. In India about 7600 Gossypium hirsutum accessions are kept at the Central Institute for Cotton Research (CICR) in Nagpur and Coimbatore, and the National Bureau for Plant Genetic Resources (NBPGR) in New Delhi. 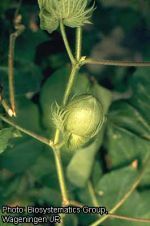 The Cotton Germplasm Collection of the United States Department of Agriculture, Agricultural Research Service (USDA/ARS) at College Station in Texas, United States, contains about 6300 accessions of Gossypium hirsutum). In Russia the N.I.Vavilov Institute of Plant Industry (VIR) in St Petersburg holds about 4500 accessions of Gossypium hirsutum. The genebank of the Centre de Coopération Internationale en Recherche Agronomique pour le Développement (CIRAD) at Montpellier, France, also contains about 2200 accessions of Gossypium hirsutum. The Brazilian Agricultural Research Corporation (EMBRAPA) maintains about 1700 Gossypium hirsutum accessions. In Australia about 1500 accessions of Gossypium hirsutum are held by the Commonwealth Scientific and Industrial Research Organisation (CSIRO) in Narrabri, and the Australian Tropical Grains Germplasm Centre (ATGGC) in Biloela. 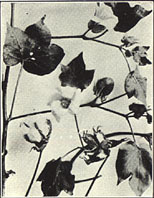 Until the 1930s cotton breeding was limited to crossing within the diploid and tetraploid groups. After this, polyploidization of the diploids greatly increased breeding opportunities. Crosses between Old World and New World genotypes have become important, especially for resistance breeding and the breeding of better cultivars for regions in Asia where Gossypium arboreum and Gossypium herbaceum grow well, but Gossypium hirsutum does not. F1 hybrid cultivars with considerable hybrid vigour for yield have been successfully developed. However, the available systems of cytoplasmic male sterility have been inadequate for large-scale production of hybrid seed, mainly due to incomplete expression of fertility restorer genes in the male parents. Current use of cotton hybrids is limited to South Asia and China, where seed production by manual emasculation and pollination is economically feasible because of low labour costs. The main objectives in cotton breeding, apart from higher yields, are photoperiod-insensitivity, early maturity, adaptation to mechanical harvesting (through low growth, little branching, short flowering period, loosely attached seeds, less hairy leaves), fibre quality (length, fineness, strength and elasticity), seed quality (high oil content and low gossypol content, increased suitability of the presscake as a source of protein for humans and animals), resistance to diseases (e.g. bacterial blight and Fusarium wilt) and pests (e.g. bollworms, jassids) and tolerance to drought, cold and salinity. There has been little progress in breeding for pest resistance (except for resistance to jassids), but much success has been obtained in resistance and tolerance to Fusarium and Verticillium wilts, bacterial blight and nematodes. Cotton breeding is based on the great variability in plant characteristics (plant structure, leaf shape, fruit size and fibre characteristics such as length, quality and colour) within populations of cultivated cotton resulting from spontaneous hybridization and mutations that have occurred over many years. Two methods successfully applied in cotton breeding include mass or line selection, used to select new strains from varieties that are already adapted for cultivation, and genetic crossing, used to combine favourable characteristics of related parents. Cotton breeding is based on two important criteria: fibre properties (length, uniformity, fineness, maturity, strength, colour), and productivity (plant habit, earliness or lateness, boll shedding, boll size, manner of boll opening, hairiness, bract characteristics). Cotton breeding work in Africa is build on earlier breeding in the United States. 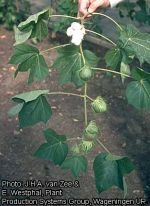 The work on Gossypium hirsutum race ‘latifolium’ was centred on fruiting irrespective of daylength, and photoperiod neutral cultivars developed in the United States have been introduced successfully into almost all cotton growing areas of the world. Most cotton-growing countries in sub-Sahara Africa have their own breeding programmes. Very successful breeding programmes were undertaken by the Cotton Research Cooperation (CRC) in East Africa, and the Research Institute for Cotton and Exotic Textiles (IRCT) in West Africa. The main thrust of the breeding work was development of high-yielding cultivars and the incorporation of resistance to pests and diseases. The breeding work helped to raise average lint yields of rainfed cotton from 200 to 1000 kg/ha, and the ginning outturn from 35 to 42%. Furthermore, the ALBAR gene for resistance against bacterial blight, and hairy leaf surface for resistance to jassids and aphids were incorporated. Thus, some of the best cottons in the world have been produced from the medium long staple upland cottons bred in East Africa and grown in the Mwanza region in Tanzania and the cotton growing areas of Uganda. Current breeding work in tropical Africa is focused on developing early maturing and drought tolerant cultivars for regions with low and erratic rainfall, and high-yielding cultivars for production under irrigation. Molecular breeding has been applied to cotton with considerable success. Genetically modified (GM) Gossypium hirsutum cultivars were worldwide grown on 21 million ha in 2010. An important example is Bt-cotton, GM cotton with resistance to bollworms based on Bt genes derived from Bacillus thuringiensis. The first commercial release of Bt-cotton in sub-Saharan Africa was in 1999 in South Africa, where Bt-cotton was reported to give higher yields and to reduce the use of pesticides. However, the economic advantages for farmers were less than originally expected, because of the continued need for spraying against other pests and the high price of the Bt-cotton seed. In Burkina Faso field trials with Bt cotton were started in 2003/2004, and it was found that bollworm incidence was reduced by 92%, while yields increased by 15–20%. About 115,000 ha were sown with Bt-cotton in Burkina Faso in 2009, and 260,000 ha, by 80,000 farmers, in 2010. In Tanzania field trials with Bt-cotton were started in 2005. Cotton has also been genetically modified to express resistance to the herbicides bromoxynil (‘bromoxynil-resistant cotton’) and glyphosate (‘glyphosate-tolerant cotton’). Some GM cotton cultivars have combined insect and herbicide resistance. So far, there has been little proven evidence of negative effects of GM cotton on the environment. Although the share of cotton fibre in the world fibre market (including synthetic fibres) has decreased from 50% in the 1970s to 36% in 2008, the demand for cotton fibre has grown consistently. Long-term projections suggest that world consumption of textile fibres will expand annually by about 3.3% in the next decade to 110 million t in 2020. Thus, the demand for cotton fibre is expected to rise significantly. In the past decades the cotton production in tropical Africa increased, especially in West Africa, where the growth rate was much higher than world average. Thus, with proper strategies and technologies in place, tropical Africa can make a significant contribution to meeting increased cotton demands of the world market in the future. Gossypium hirsutum will remain the most important source of cotton, as it is highly productive and shows strong yield responses to improved growing conditions, fertilizers, crop protection and supplementary irrigation. An important issue in cotton cultivation is the high level of pesticide use. To lower the use of pesticides, Integrated Pest Management should be further developed in close cooperation with cotton farmers. The use of genetically-modified cotton such as Bt-cotton and herbicide-resistant cotton is another promising option, though its use is still meeting public resistance in some countries. Concerns about the negative effects of common cotton growing practices, especially the large amounts of pesticides applied, on human health and the environment has led to increased importance of organic cultivation. However, yields are low in organic cotton growing, and, consequently, the price is very high. • Burkill, H.M., 1997. The useful plants of West Tropical Africa. 2nd Edition. Volume 4, Families M–R. Royal Botanic Gardens, Kew, Richmond, United Kingdom. 969 pp. • Eicher, C.K., Maredia, K. & Sithole-Niang, I., 2006. Crop biotechnology and the African farmer. Food Policy 31: 504–527. • FAO, 2011. FAOSTAT. [Internet] http://faostat.fao.org/ site/291/ default.aspx. Accessed September 2011. • Fryxell, P.A., 1978. The natural history of the cotton tribe (Malvaceae, tribe Gossypieae). Texas A & M University Press, College Station, Texas, United States. 245 pp. • Kerkhoven, G.J. & Mutsaers, H.J.W., 2003. Gossypium L. In: Brink, M. & Escobin, R.P. (Editors). Plant Resources of South-East Asia No 17. Fibre plants. Backhuys Publishers, Leiden, Netherlands. pp. 139–150. • Matthews, G.A. & Tunstall, J.P., 2006. Smallholder cotton production in sub-Saharan Africa: an assessment of the way forward. International Journal of Pest Management 52(3): 149–153. • Peeters, M.-C., van Langenhove, L., Louwagie, J., Waterkeyn, L. & Mergeai, G., 2001. Cotton. In: Raemaekers, R.H. (Editor). Crop production in tropical Africa. DGIC (Directorate General for International Cooperation), Ministry of Foreign Affairs, External Trade and International Cooperation, Brussels, Belgium. pp. 1041–1070. • Smith, C.W. & Cothren, J.T. (Editors), 1999. Cotton: origin, history, technology, and production. John Wiley & Sons, New York, United States. 850 pp. • Verdcourt, B. & Mwachala, G.M., 2009. Malvaceae. In: Beentje, H.J. & Ghazanfar, S.A. (Editors). Flora of Tropical East Africa. Royal Botanic Gardens, Kew, Richmond, United Kingdom. 169 pp. • Adjanohoun, E.J., Adjakidjè, V., Ahyi, M.R.A., Aké Assi, L., Akoègninou, A., d’Almeida, J., Apovo, F., Boukef, K., Chadare, M., Cusset, G., Dramane, K., Eyme, J., Gassita, J.N., Gbaguidi, N., Goudote, E., Guinko, S., Houngnon, P., Lo, I., Keita, A., Kiniffo, H.V., Kone-Bamba, D., Musampa Nseyya, A., Saadou, M., Sodogandji, T., De Souza, S., Tchabi, A., Zinsou Dossa, C. & Zohoun, T., 1989. Contribution aux études ethnobotaniques et floristiques en République Populaire du Bénin. Agence de Coopération Culturelle et Technique, Paris, France. 895 pp. • Anonymous, 2008. The biology of Gossypium hirsutum L. and Gossypium barbadense L. (cotton). Version 2. [Internet] Australian Government, Department of Health and Ageing, Office of the Gene Technology Regulator http://www.ogtr.gov.au/ internet/ogtr/publishing.nsf/content/cotton-3/$FILE/ biologycotton08.pdf. Accessed September 2011. • Bhat, R.B., Etejere, E.O. & Oladipo, V.T., 1990. Ethnobotanical studies from Central Nigeria. Economic Botany 44(3): 382–390. • Campbell, B.T., Saha, S., Percy, R., Frelichowski, J., Jenkins, J.N., Park, W., Mayee, C.D., Gotmare, V., Dessauw, D., Giband, M., Du, X., Jia, Y., Constable, G., Dillon, S., Abdurakhmonov, I.Y., Abdukarimov, A., Rizaeva, S.M., Abdullaev, A., Barroso, P.A.V., Pádua, J.G., Hoffmann, L.V. & Podolnaya, L., 2010. Status of the global cotton germplasm resources. Crop Science 50: 1161–1179. • David, O.M. & Falegan, C.R., 2007. Effect of fermentation on physicochemical and antibacterial activity of cottonseed oil. Journal of Pure and Applied Microbiology 1(2): 181–184. • Dowd, M.K., 2011. Cottonseed oil. In: Gunstone, F.D. (Editor). Vegetable oils in food technology: composition, properties and uses. 2nd Edition. Blackwell Publishing, Oxford, United Kingdom. pp. 199–224. • ECOCROP, 2007. Gossypium hirsutum. [Internet]. FAO, Rome, Italy. ecocrop.fao.org/ecocrop/srv/en/dataSheet?id=1160. Accessed September 2011. • ICAC, 2008. Cotton production practices. International Cotton Advisory Committee, Washington D.C., United States. • ISAAA, 2011. ISAAA Brief 42–2010: executive summary. [Internet] International Service for the Acquisition of Agri-Biotech Applications, Manila, the Philippines. http://www.isaaa.org/ resources/publications/briefs/42/ executivesummary/default.asp. Accessed September 2011. • Jarman, C., 1998. Plant fibre processing. A handbook. Intermediate Technology Publications, London, United Kingdom. 52 pp. • Lopes, D.C. & Steidle Neto, A.J., 2011. Potential Crops for Biodiesel Production in Brazil: a review. World Journal of Agricultural Sciences 7(2): 206–217. • Lukonge, E., Labuschange, M.T. & Hugo, A., 2007. The evaluation of oil and fatty acid composition in seed of cotton from various countries. Journal of the Science of Food and Agriculture 87(2): 340–347. • Mellet, M.A., Schoeman, A.S. & Broodryk, S.W., 2003. Review of insect pest management strategies for the organic cultivation of cotton. African Plant Protection 9(2): 61–86. • Morse, S., Bennett, R. & Ismael, Y., 2005. Bt-cotton boosts the gross margin of small-scale cotton producers in South Africa. International Journal of Biotechnology 7(1–3): 72–83. • Patel, K.V., Varghese, S., Patel, P.G. & Patel, U.G., 2002. Oil and fatty acid profile of different varieties of Gossypium species. Journal of Maharashtra Agricultural Universities 27(3); 315–316. • Purseglove, J.W., 1968. Tropical Crops. Dicotyledons. Longman, London, United Kingdom. 719 pp. • Seignobos, C. & Schwendiman, J., 1991. Les cotonniers traditionnels du Cameroun. Coton et Fibres Tropicales 46(4): 309–333. • Smith, C.W., 1995. Crop production: evolution, history, and technology. John Wiley & Sons, New York, United States. 469 pp. • Ververis, C., Georghiou, K., Christodoulakis, N., Santas, P. & Santas, R., 2004. Fiber dimensions, lignin and cellulose content of various plant materials and their suitability for paper production. Industrial Crops and Products 19: 245–254. • Wallace, T.P., Bowman, D., Campbell, B.T., Chee, P., Gutierrez, O.A., Kohel, R.J., McCarty, J., Myers, G., Percy, R., Robinson, F., Smith, W., Stelly, D.M., Stewart, J.W., Thaxton, P., Ulloa, M. & Weaver, D.B., 2009. Status of the USA cotton germplasm collection and crop vulnerability. Genetic Resources and Crop Evolution 56(4): 507–532. Based on PROSEA 17: ‘Fibre plants’. Ikitoo, E.C., 2011. Gossypium hirsutum L. [Internet] Record from PROTA4U. Brink, M. & Achigan-Dako, E.G. (Editors). PROTA (Plant Resources of Tropical Africa / Ressources végétales de l’Afrique tropicale), Wageningen, Netherlands. <http://www.prota4u.org/search.asp>. Accessed . There are 24 study abstracts related to Gossypium hirsutum L.. Click on "show more" to view them. There are 100 book citations related to Gossypium hirsutum L.. Click on "show more" to view them. 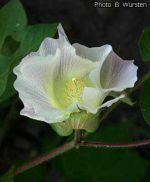 There are 100 citation in web searches related to Gossypium hirsutum L.. Click on "show more" to view them. There are 100 citation in scholarly articles related to Gossypium hirsutum L.. Click on "show more" to view them. There are 100 news article citations related to Gossypium hirsutum L.. Click on "show more" to view them. There are 20 citations in Afrirefs related to Gossypium hirsutum L.. Click on "show more" to view them. There are 29 Wikipedia citations related to Gossypium hirsutum L.. Click on "show more" to view them. 1, flowering branch; 2, flower in longitudinal section; 3, fruit; 4, opened fruit.